The famous Notre Dame Cathedral in Paris, France that was built between 1163-1385 is currently going up in flames. CNN is now covering this and says the flames are coming out of the cathedral itself. This is a horrible way to start Easter week. I hope they get it under control very soon. They are blaming the fire on ongoing renovations. Don’t be surprised if the initial reports of this being related to the ongoing renovations turns out to be wrong. Notre Dame spokesman André Finot says entire wooden frame, is on fire and says “nothing will be left”. prevention procedures. It Does not look like they had them from all the photos that I have seen. cathedral, told NBC News that, to his knowledge, the church’s organ and stained glass windows were not damaged. I pray he is correct about the organ and windows. I saw a photo of the interior and it didn’t look as bad as it could have. Now, if he is correct in his second sentence, how do fires start in two different places? Just one of the 3 magnificent rose windows that was lost – and that is just a miniscule part of the loss. A true tragedy. Thank God that His church (all believers) will stand forever. Clearly the French authorities had no plan, should a fire break out at a historical site at the heart of Paris. 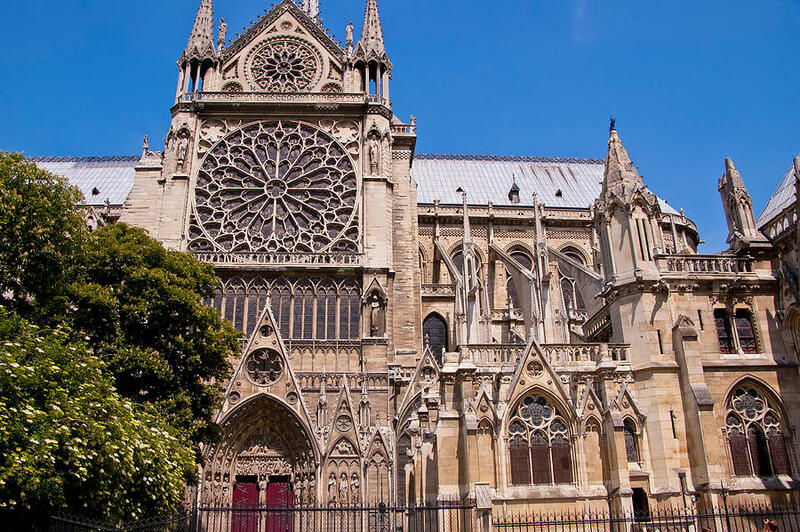 The Louvre, the d’Orsey, and many other irreplaceable buildings housing priceless art are located just down from Notre Dame. Do they have plans, should fire break out here, too? It’s just incredible. For instance, they should not have the adjacent streets open to traffic. Agesilaos Right! It’s shocking!!! What a shame. It really does feel like the French 9-11. Not as awful as ours when you think of human lives, but architecturally, culturally and spiritually it is devastating, losing something that’s a part of your life, your fundamental culture. As Pres. Trump said, a priceless treasure. Next some Muslims will try to buy the property and build an “Islamic Center” on it. This is exactly what they do everywhere–its called Islamic conquest whether this was arson or not! What, you mean some “charity,” like the Holy Land Foundation? …or what was the name of group behind the Park 51 “community center” you referenced? There are so many living there it would not surprise me if some were doing that. When you see the joy that Ilhan Omar takes in being anti-Semitic, it’s no longer farfetched that there are plenty of others, not all. Sections of Paris are muslim strongholds where non-muslims simply no longer go, including the French Gendarme. We cannot have that happen here. Is there any question that islam would love to destroy the National Cathedral in WADC and make it into a victory mosque, as well? I-Ham Omar and Rashid Tlaib would be at the forefront and no demonrat would oppose them. Just another reason that demonrats can never be trusted with any power at all. I just tried this link and my anti-virus warning went crazy. Just saying. I saw the link with no problem, anti-virus was fine with it. Same here! I saw it earlier today as well without incident. A shadowy figure can be seen walking during the fire. Doesn’t look like a firefighter to me. Has the Pope issued a statement yet? I haven’t seen anything in the news about it. Who the heck cares what that imposter says? Some are saying that they saved it? What a SAD day in Firefighting History this will turn out to be! I’m devastated. I just visited this cathedral last week. Awful. We’ve been wondering the same thing. Shock… that’s all I got. Maybe it’s just the paranoid Soldier cop in me, but the first place my mind goes is ARSON. I’m the first one to jump on the terrorism bandwagon, but this seems like a construction disaster to me. An immeasurable construction disaster. My hope is that the the French people will be inspired to rebuild the cathedral and rediscover their heritage. Donna Brazille on Fox’s “The Five” (???) lamenting the fire. I guess she figures that gives her one less place to go and confess her lies. You know, I usually like to watch the 5, (especially when Jasper makes an appearance!) but I absolutely abhor Donna Brazille, and for the life of me can’t figure out why Fox insists on hearing her opine on the days events. Anyway, that was a channel changer for ME. YUK. BRING JASPER BACK!! Anyway, they have to have their token lying progressive for “fair and balanced,” but I adore Lawrence Jones, who countered her every word. That said, I like her new hair style and the make-up artists at Fox have done a great job on her face! She actually looks attractive….on the outside. Charli I love Lawrence Jones! He started his career at The Blaze and would often appear on Dana Loesch’s show when she was there. He was really green, but I just loved him and thought as soon as he gets experience, he’ll be great! I’m so glad he’s doing so well and has become an articulate, conservative young man. I know that his momma is proud! He always talked about her when he was at The Blaze and how she kept him in line. Gotta love it! Jasper is certainly more intelligent than DB! But expect more of this as Rupert’s liberal sons are now running ruining FOX. I’m afraid you’re probably right. What a horrible thing. What a sad and tragic end to one of the most magnificent buildings in the world. 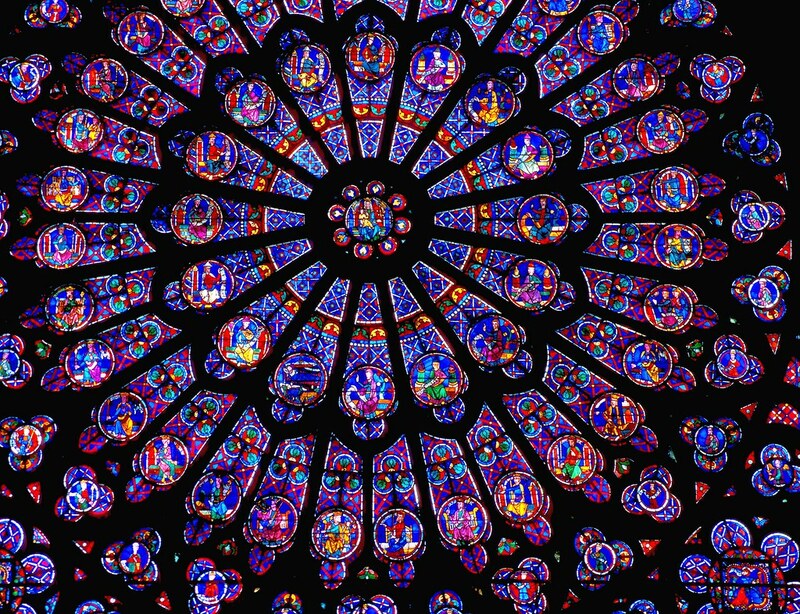 I love stained glass windows and the thought of the 3 rose windows of Notre Dame being gone hurts my heart. Paris will never be the same with the loss of “Our Lady”. 850 years gone in flames. I feel bereft. Hit me that way too. I was driving in heavy traffic, listening to K-LOVE when they announced the fire…I was overwhelmed to tears. Unimaginable loss. It is a shame, but the big Cathedral in Heaven awaits us forever. Amen! Of course it is. The burning of a church/cathedral doesn’t destroy the faith. But the beauty, the artifacts, the history are something important to us here on earth. Men built it to glorify God and it has stood for 850 years – that is a terrible loss. This church has stood for almost 900 years, survived 2 world wars and now is taken down by scaffolding spontaneously combusting? There was no one killed or injured, and apparently on one working at the time? There are hundreds if not thousands of orange-squeezer and flying saucer churches that deserve to be burned. And we lose Notre Dame. That’s what I wondered too. Hubby agreed and he used to work in construction. Even the “planks” they stand on are normally metal now. And the poles are certainly metal. My first guess: muslim terrorists. What are the odds? I am probably wrong, but that was the thought that crossed my mind. Renovations my a$$. Someone deliberately burned it. I know the Catholic Church has many enemies, but is there one in particular that would be PROUD of this act? Hmm? Just sayin…. Could be radical extremist atheists too, I suppose, but it seems something this big would be motivated by more, like a false god. Just got home and just now heard about this. What a horrible tragedy! While it’s too soon to know what the cause is, I hope everyone can keep a cool head until the facts come out. We should know soon enough. Fox News is just now reporting the fire is no longer spreading. That is something to be grateful for, along with, of course, no loss of life. Some are suggesting the fire was intentionally set. I can’t even look at this stuff. It causes physical pain for me. Horrible. Shemp Smith (not a typo) interviews French official about the fire. When it`s mentioned about political correctness – the interview is cut short. What a jerk you are Shemp. That was disgusting the way he cut him off, didn’t even let him say we need to be ready for the *possibility* of arson/terrorism. Glad I saw it when I was younger. It was beautiful. Bureaucrats starting an “Adopt a Hunchback” program ($). I have no doubt that they’d cover it up if it turns out to be terrorist-motivated arson. Gee! What “sort” of terrorism? It very well could be related to the ongoing renovations, as in flammable materials near an ignition source. Also, a possibility, lax security caused by the construction work going on. Either way, it is a related to the ongoing renovations. @ttt Yeah, I get Jihad Watch and The Geller Report and it’s really amazing how much the islamosavages get away with and the regular folks get the shaft. What a shame….hope no one is harmed. When will the finger pointing begin, as mentioned here this fire is of questionable origin… Big fire growing fast, in an old big timber structure ????? Good Job France… What a sad day this will be in Firefighting History!!! I agree, it seems entirely likely that a flammable substance was spread first. This is too coincidental, and it is inconceivable to me that there was no one watching out for fire, no fire extinguishers near the work, etc. Even with it made of wood, it spread too fast. I also can’t believe there was no system for fighting fire in this world wonder. And they’re now talking of possible total loss???!!! There are pics of some muslims cheering right next to Christians who are crying. It`s infurariating. Many of us who’ve reached a certain ‘age’ in life are more skeptical; that narrative came out almost before the news of the fire itself. Kinda strange is all I’m saying. Exactly. Once the fire is over an investigation can be conducted on how the fire started, what the response times were and why, and if there was a fire-fighting plan, why did it fail, or if there wasn’t one, why not? They can’t even start a serious investigation until experts can examine the ruins and investigators can question anybody involved. If they can’t get in to fight the fire, how can they have access to make a determination on the cause? To be clear, I have no idea what caused it. Renovations frequently lead to fires because there are flammable chemicals, heat sources, and improvised electrical connections. Still, pushing a narrative on the cause and who to blame while the fires are still climbing is irresponsible and based on a fundamental lie: that they know anything. Also, given they’ve been renovating the last 600 yrs or so, it’s kinda weird that renovations during Holy Week 2019 cause it’s demise. Yep. Plus, recall how meticulous restoration work has been on other treasures, like the Sistine Chapel. I simply cannot believe that no precautions were taken for fire. And if there weren’t, that too is criminal in itself. People singing in the street near the burning cathedral. A moment of beauty during this tragedy. Just unreal…its really hitting me now so many relics and so many ceremonies our catholic heritage…..our Lady of Peace! Mary mother of Jesus has appeared many times and all she asks us to do is pray for peace. Me too! I am very proud and feel very lucky to have been born into a catholic family….if you are a true believer this is very painful. Makes me wish I gone to see it! Thanks I had not heard of the Sagrada Familia! Side story…I went to a Catholic school called Notre Dame in grade school…then when we moved to FL I went to a high school called St Thomas Aquinas….same school Chris Evert the tennis player attended. I tell my brother about Right Scoop and once I asked him..”are you Thomas Aquinas?” He laughed and said no….not me! Wow, Catholic League president Bill Donohue was just on with Neil Cavuto. He immediately raised the suspicion of other recent church desecrations and Cavuto shut him down, hard. I don’t mind the speculation. Today is probably not the best day to do it, though. It’s why I have a 3-day rule on hot takes. True, but I like Donohue’s style. He doesn’t fear the PC police. I think differently. Judging from omar and what is happening to Christians and Christian churches in this world, we should not be silent. We should be able to speculate, those that shut that down have no right to silence the speech if others. They’re playing it cautious, unlike the rest of the MSM which probably will claim it was caused by climate change. Cavuto had a pretty good radio on Fox/XM before the merger and it became a premium channel. I dropped Sirius/XM a few months after the merger. I kinda miss it. I heard him. He was curt. Bill Donahue has been around for a very long time and once you get past his high-pitched voice, he’s an interesting guy. Very smart and a faithful Catholic. Cavuto didn’t return to television as a humble guy nor all that fair to some guests (after his absence from Fox for health reasons.) Didn’t see the exchange but my feeling is that Cavuto is leaning away from the right more and more every day. Yes, I heard it….looks like the Fox show hosts all got the same memo from the top! Let’s see what the prime time hosts say. If Laura has Raymond Arroyo on, will he repeat the mention of the recent desecrations? Especially since they just hired Donna Brazille. Yuck! And here I thought Juan made me change the channel. Are you KIDDING me?? If she’s a regular, I no longer will be. Watching Juan was pushing it. Sorry Hidy, not kidding. Fox seems to be on a downward spiral aka drain. This may be the result of an accident. Or, just maybe, it was yet another in a series of premeditated attacks, and the not-so-brave French government is anxious to deflect suspicion from the Usual Suspects. Something tells me it’s going to be a long time before Claude Rains throws the bottle of Vichy in the trash basket. Nice reference to the bottle of Vichy water…good one. Read the very first comment under this story! An 8:14 am post. Edit: the post was from yesterday, but still apropos. It’s Holy Week, it’s not a coincidence. Yesterday was Palm Sunday but perhaps a ‘workman’ couldn’t get in on Sunday. Palm Sunday has typically been a day when jihadis attack Christian churches. News just reported it took firetrucks 2 hours to get there. Incredible. I mean were there specific delays, units committed to other fires, late alert, traffic, or just insufficient coverage? That at least explains why I saw several videos with cars moving by, but no emergency personnel whatsever — or even sirens on the background audio — even after the spire fell. There are a lot of tough questions to ask of many people…I hope there are enough French patriots to demand a real investigation. TXGRunner No they didn’t. Notre Dame sits on an island of sorts. I don’t know what the transportation system is like around it. Right in the city center, plenty of access via multi-lane bridges. Minutes from the same fire stations covering the president’s offices, foreign ministry, city hall and the like. In other words, fire & rescue should be there in minutes any time day or night. spiritof61 Then there really are answers to pursue here. Yes. All we can do is wait for facts to emerge. Attempts to shut down discussion and change the subject are to be expected, of course. France has suffered another big hit and derrieres need to be covered (and kissed). And you know as well as I do that it’s only going to get worse. Much worse. Well written; striking the right balance between prudence, cynicism, and just observation. Unfortunately, shutting down discussion seems to be the favorite approach of many in authority…even here. Many many cars on the bridge, along with many people sightseeing. Any islamosavages on the fire crews, I wonder? I was wondering same thing except about restoration crew? Did this start at 10pm France time? No, I think I heard around 5:30 pm…it was before sunset. Many are wondering about boats for fire fighting, none were seen. Fires can smolder for a long time. We’ll probably know more later, but if it was terrorism it’s quite possible that it’ll be hushed up. That is …. ‘unacceptable’ is not a strong enough word. Criminal? …maybe have a plan in place for structures requiring special handling…just saying. Here’s an idea, howbout *not* just saying. I’m not the only person in this thread commenting on the apparent lack of an aggressive response. Where have you posted replies asking others to stop commenting? You’re an editor, If you don’t want me making comments, ban me. Howbout you get some common decency and save the recriminations until after the catastrophe? How hard is that to comprehend? Leave the politicization-during-the-disaster to the left. They love that. I don’t see anything wrong with your comment. I don’t get some here acting like the left and trying to shut down speech. It’s called a reply. That’s actually speech. You would have thought ‘modernization’ would require some sort of fire prevention system inside the Cathedral. To have this just go up in flames…tsk. I heard some work was done in the 19th century. When the French cared and weren’t fools. What have the laggards done in the past 100 years? It is VERY odd that an iconic structure, the face of Paris, wasn’t thought important enough to have some kind of ‘plan for emergencies’ in place…it’s hard to wrap your mind around it. Apparently we aren’t supposed to ask such inflammatory and prejudicial questions about why there didn’t appear to be a plan, why it took so long for fire fighters to respond, or why upon arriving, they appeared to not take aggressive actions to contain the fire or save the structures not yet in flames. Apparently we are supposed to start in on blame, recriminations, and judging while first responders are trying to deal with it, just like a leftist ghoul. The questions about the response time are valid. Same as when Princess Diana died in that Paris tunnel. Many say she could have survived her injuries. They’re reporting now if the bells go, the 2 towers will come down. Sky’s gothic architecture expert is speculating that MAYBE the two towers survive (unless the fire spreads), but the Church proper is likely a total loss. The roof’s collapse is compromised the rest of the structure because gothic architecture depends on interlocking. Says it’s amazing that the walls are still up right now, but he doesn’t expect them there by morning. 10-20 years of reconstruction, $100M euros minimum. As a big fan of the subject myself (historical architecture), what really strikes me is that… yea, we can reconstruct it. But the ancient timbers are gone forever. The blood and sweat that went into that medieval construction, limited as it was by the tools of the era, is gone forever. Rebuilding is great, but the true tragedy is the loss of its origins. It won’t be the Cathedral of Notre Dame anymore. It’ll be a modern-made replica. That’s the most heartbreaking part of it all. Those artists/artisans were absolutely incredible, they deserve great admiration. I have to wonder if, w/ that being gone, the ambiance will be lost as well. I am someone who LOVES to stand in a place of historical import, and just let myself FEEL the energy of the events that occurred hundreds of years ago. It just makes you feel connected to all of time. There’s really no good way to explain it. But that feeling is what I brought home w/ me. What an historical loss for the Church Universal! This is good news – Sky just had a cathedrals expert on, and she suggests that many of the artistic treasures should be in and therefore protected by virtue of the fact that Notre Dame’s crypt is stone. It’s a good day to reflect on the various reasons why this is a tragedy. In Jordan Peterson’s lecture series on the Bible, he has often pointed out how remarkable it is that throughout Europe, really throughout the old Roman Empire, that so much human capital and so many resources have been used to create iconic images, structures, and spaces. It has all been beautiful and made Old Europe such a wonder to visit for centuries. It’s safe to say that the most enduring and most voluminous works of these have been of Christian inspiration. On one scale, this ruin is barely a loss. On another it is one of the greatest losses in human history. So it will take years to understand the consequences.